Athletes could not walk on the track to get onto the field, even on game day. (Carmela Rourke '11/The Stampede). September 18. 2010. A delay in the construction of a new track has, until recently, caused our student athletes to practice a very important virtue: patience. When the old track was installed in 1999, the administration was told that it would have a ten-year life span, and so it did. Going on its eleventh year, the track began to deteriorate. “The asphalt in the track started to become visible,” Ms. Jessica Nash, athletic trainer, explained. “There have been some injuries caused by it as well, such as shin splits.” Students complained about the wear of the track, saying that it was painful to practice on. The delay caused some games and practices to be rescheduled such as those of the Men’s Soccer team. “For the first game, we were hoping to play at home to have the fan support for the start of the season,” said Jorden Howard ‘11. The boys had to postpone the home game and travel away instead. “It was disorienting for us,” explains Josh King ‘12. To make up for the delay, Doc Inc. (the contractor) will be giving McNamara complementary drainage around the field. The new track was completed on Oct 12, 2010. It features vibrant colors of maroon and gold, whereas the old track was simply black asphalt with plain white lines. Already the track team has held practice on the track and enjoyed it. “Compared to the old track, it is much lighter on my feet and not as hard,” said track member Shanelle Debraux ‘11. If real men wear pink then McNamara is full of real men. The “Mustangs Go Pink” campaign is up for its second year in a row and the school is going full-fledged pink. The science department, National Science Honor Society, student council, and the athletic department teamed up to get the school behind Breast Cancer Awareness month. 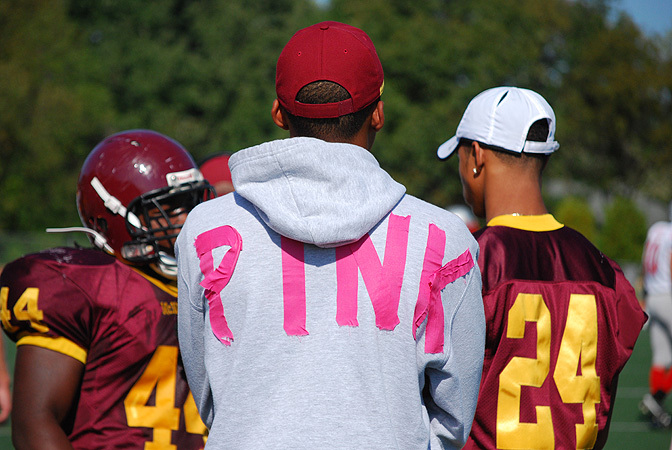 The volleyball, soccer, and football teams were all “‘swaggin’ pink” as Nico Law ‘11 said on WMAC. They had pink tape, pink socks, and pink pre-wrap so when the players were competing, one could clearly tell they were representing the pink. The rest of the school’s chance to get involved in the dress down day on Friday, October 8th. For two dollars, one could dress down in an outfit that was at least 50% pink, and many students went further than that. All of the proceeds are to be donated to the National Breast Cancer Foundation. According to Ms. Kazimer the school raised about $2000 in its efforts. Last year was the first year for the campaign, an idea that was brought to Ms. Denise Kazimer, science department chair, by the volleyball team. They had taken part in the Dig Pink volleyball tournament that had supported breast cancer as well. Ms. Kazimer then took the idea saying that “In supporting this, we’re supporting all cancers.” Many members of the McNamara community have been either personally affected or known someone who is affected by cancers such as Breast Cancer. To add to the events, Jennifer Retener ‘11 decided to contribute with her senior service project. She made pink hair bows and sold them at her church and at lunch for one dollar. All of the proceeds went to the National Breast Cancer Foundation as well. She got the idea because making these bows was already a hobby of hers. “She’s always made bows ever since she was little, so she thought she could use one of her skills for the betterment of something else,” said Jennifer’s close friend Kelsey Jones ‘11. The fact that the whole school was getting behind to support meant a lot to some students. Brandon Whitelow ‘13 appreciated the support, being that he has an Aunt who has survived breast cancer. “It’s good to see kids who understand,” he said. A rivalry can mean many different things. To some, it means to strongly dislike another school. To others, it may not be a big deal. To our athletic director, Anthony Johnson, a rivalry is when those schools in a conference exchange victories and defeats as well. There are many memorable rivalries in pro sports such as the Redskins versus the Cowboys, the Celtics versus the Lakers, or the Yankees versus the Red Sox. When it comes to high school sports, it becomes a little unique. The WCAC is widely considered one of the toughest conferences in high school sports. In the WCAC, there are rivalries all around the conference, but for some alumni, the current rivalries we have today were not what they experienced years ago. Mr. Johnson, a 1988 graduate of McNamara, played basketball for the mustangs and said that some of the rivalries he considered back in his day are not considered rivals now. 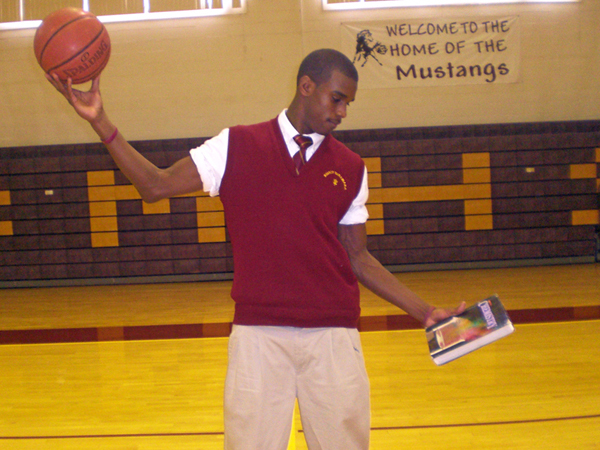 In basketball, the mustangs were rivals against St. Johns, Carroll, DeMatha, and a old conference school named Macon High School. Johnson also said that it was very different in 1988, when McNamara and many other schools in the WCAC were all boys schools and the competition was very high, but different sports have different rivals. Counselor Roland Grimes, who played football at McNamara, said that they were also rivals with DeMatha, Carroll, St. Johns and also O’Connell. When asked about how the conference is currently, he said that the conference has become more talented, competitive and wide open so that anyone can win. There many differences between WCAC several years ago and the WCAC currently. One change Mr. Johnson has noticed around the conference is that girls basketball has become a lot more competitive. Many of the other schools throughout our conference consider McNamara a rival. Another contributor to the rivalries has been the help of the internet. Mr. Johnson said that social networks, such as Facebook and Twitter, have made the rivalries more healthy and are building more with other schools. Overall, the WCAC is a very diverse conference that expects intense, more competitive games and rivalries to develop in the future. Casey Gouldman '11 and Addie Miller '11 get ready to swim againist the opponent St. Albans. Photo by Jackie Corley '10. Now that their seasons are over, the swimming and diving program can reflect on this year’s highlights. Jenny Klimczak, the swimming coach, summed up the swimming season saying the team was “doing their best.” She expanded on this for the boys who won all but two of their meets. 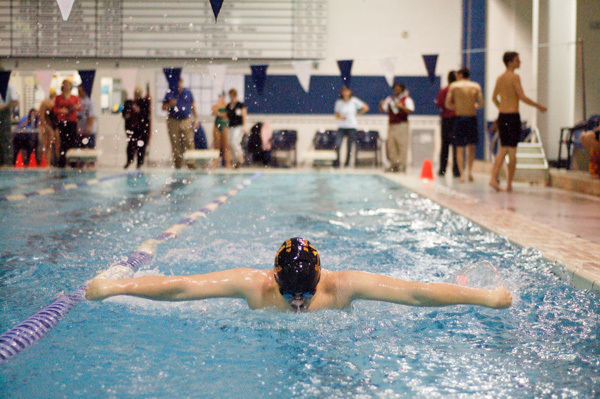 This year, the swim team was able to have a team of fifty people. The new comers have fully embraced their new membership with the swim team. Ms. Klimczak talked about the continuing improvement of Cole Holloma ’13 and Carmela Rourke ’11 and believes they will be significant contributors next year. Jada’s departure will leave a significant void in next year’s diving lineup. Her contributions will definitely be missed. Tyler Bryant '11. Photo by Grant Hill '10. Returning runners are keeping the Track and Feild team competitive. Team Captain, Kiertson LaRoche is an all-around athlete. She is a tremendous jumper and a multi-event player. 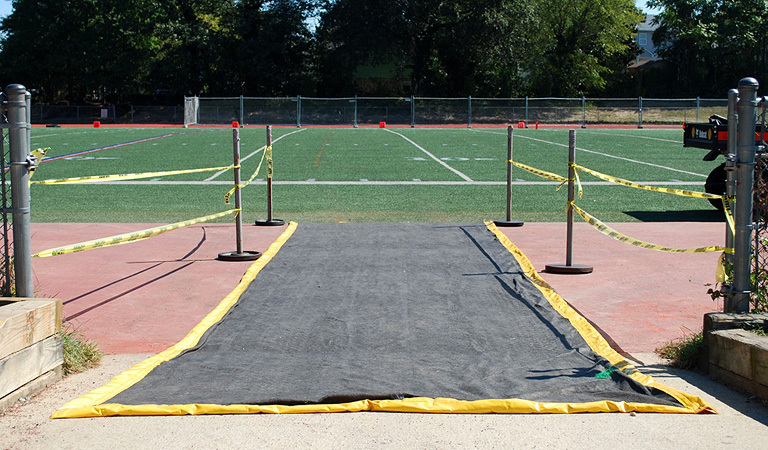 A multi-event player does everything such as hurdles, long jump, high jump, 400, 4×200, and so on. Her personal record in the high jump is 5’6 and in the long jump she jumped 18 feet. She did really well in the meet in Mahattan, New York on January 9. She competed in the hispanics games, placing 1st in the long jump finals with a distance of 18-2.5 3. Although, LaRoche has proved to everyone that she is an athlete. She strives to place third in a multi-event, jump above 15 feet in the long jump, and 5’8 in the high jump. She added, “I’m very proud of the team with all the hard work and effort everyone has put in this year.” The mustangs have a strong group of girl runners lead by seniors Maya Lewis and Chanae Davis. Lewis sprints and jumps. She triple Jump – 34-2 and long Jump – 14-11 as her personal best. January 23- Lewis ran a new season best time of 26.05 in the 200m at Kevin Dare High School Invitational, placing 4th. Davis sprints and runs mid distance. She PR (personal record)1:31.86 at the the F.I.T (Friends indoor Track and Feild). The second team captain, Alexis Stroman 11′ (hurdles, sprints) is having a great year. She had broken the record of the 55 hurdles in the F.I.T. She PR 8.3 in the BCIA. Stroman individual best performance this season was when she PR 41.54 in the 300m at the DCIAA Invitational on January 13. She said, “As a whole we all look better and we are more unified as a team. Everyone gets along, it’s not cliqueish.” Including Juniors Chyna Brown (400m, high jump), Shannell Debraux (long, triple, high jumps, sprints), and Angelique Payne (sprints, hurdles) who are great runners as well. The Boys did really well in the DCIAA Invitational. Led by their third team Captain Christopher Spriggs 10′ who is an outstanding 400m 800m runner. January 10-13- Christopher ran a PR of 37.55 in the 300m at DCIAA Invitational and he PR 53.99 in the 400m at Hispanic Games presented by The Navy. There are many juniors that are performing terrific this season. Nigel Crawley 11′ who is one of the top hurdlers in the metro area, won second place in the hurdles of DCIAA Invitational meet with a PR 7.66. Distance runners Matthew Feather and Christian Harrison both have high endurance. Feather PR 11:46.52 and Harrison PR 10:39:06 in the 3200m at the DCIAA. Avery Gaskin 400m 800m runner said, “We try to make each other better when we race each other at practice.” Avery’s teammwork helped runner Christopher Mattocks finish the 4×4 in 51 seconds at the PGC meet. Additional, freshmen David Stone is a fast runner, who recently ran a PR of 36.87 in the 300m at DCIAA Invitational, placing 4th. Link: Jeff Meekins of WMAC interviews Coach Keithline of boys varsity basketball. The Varsity Men’s Soccer team headed into homecoming week with a definite mission to avenge and maintain. With two totally opposite talent levels, the mustangs were given the opportunity to split the series with the number one team in the WCAC and continue their quest towards a more a favorable place in the playoffs with a win versus St. Johns. Led by a strong group of seniors, the mustangs are stronger than what paper may reveal. Senior starter, Maxwell Allegro says, ” We have a lot of potential. The second half will be stronger than the first.” When asked how he and the team could turn there 5-5-4 in conference record around he said, “We need to approach each game with the same intensity.” This intensity would definitely be required against a Dematha squad that had only one in conference blemish on their record. Heading into the match against Dematha, Senior Jeff Meekins said, “If we do the same thing as last time and keep up what we are doing, we should have no problem pulling out a W.” Unfortunately, the men fell short to the Stags by a score 4-0. The teams resilient attitude allowed them to shake off this minor road bump in order to enjoy what would be the last spirit week for many of them. Is there a lack of focus due to the irregular week and outrageous clothing? Coach Robert Nolte says, “The guys have a good sense of when to turn it on and off. The eleven seniors on the team help to keep us focused and grounded.” He really believes that his team feeds off spirit week and the additional amount of fans will give the team a positive boost heading straght from the pep rally to their homecoming game against St. Johns. This boost could not come at a better time. “We are peaking at the right time”, says Coach Nolte, and this is definitely evident by a much improved second half of the season. Due to the competitiveness of the WCAC, ties at times feel like wins especially to a team that has dealt with a number of injuries to key players. To many people an injury to a starter would prove to be problematic. Not for these Mustangs, it was merely an opportunity to experiment and find success in different positions. As a Forward for much of his high school career, the sound of playing midfield would definitely be somewhat foreign to Allegro. 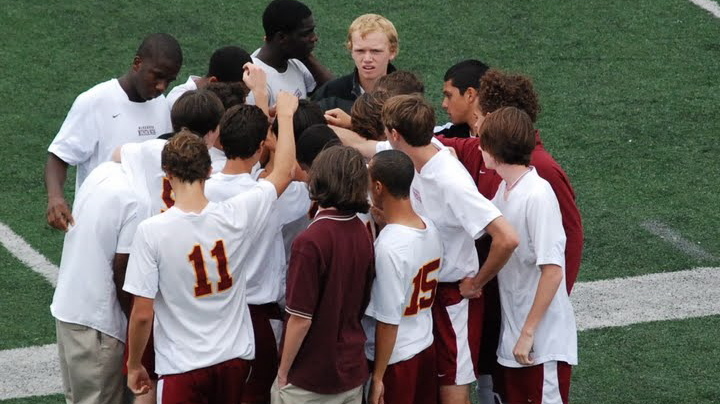 However, the loss of senior Greg Carbott early in the season left a void in the midfield that Allegro filled valiantly. When asked about his position change he says, “Im just being what the team needs me to be.” This is a team-wide attitude that Coach Nolte attributes to the strong, senior leadership. He says, “This is an amazing group of young men. They get along great and have just made a great impression this year.” As the team graduates eleven players, who will step up and replace these guys? Newly appointed Mens’ J.V. soccer coach Katelynn Chambers believes that her group of guys are ready to answer the call of duty. Freshman Andrew Smith says, “We responded well…I have never had a female coach, but she is doing a really good job. Her techniques are different from what I am used to.” She accepts nothing but maximum effort from her players and it is evident out on the field that most of the team’s victories are a result of strictly outworking their opponent. Coach Nolte says,”J.V. has had a good season. Coach Chambers has done well with focusing on the basics.” This is high praise from the coach that will inherit many of the players on her roster next year. Both of these teams had a responsibility on the Friday of homecoming week “Beat St. Johns!” With the football team coming off of an emotional victory over the cadets a week before, now was the time for the soccer team to pull out a win against the Cadets just as they did earlier in the season. As both the the boys teams headed out to the field fresh out of the pep rally, there was an added amount of energy as many students stuck around in the rain to support the Mustangs. People throughout the community bundled up and kept up the school spirit. The added energy propelled the team to an early 1-0 lead after a great goal from Senior Greg Carbott. A clutch cross much later in the game from senior Ryan Leslie set up Carbott for what would be his second, and the teams winning goal. The mustang defense held strong and the Cadets scored only one goal. Heading into the playoffs, the Mustangs are in great position to compete for the WCAC crown. Confident that they can play with pretty much any team in the league, the boys have their eyes on the prize. The majority of the tap class is made up of football players, with only a few girls. Football players are taking over the tap dance program at Bishop McNamara. Tap dance has developed and expanded significantly because of the football players. Ronald Grimes, assistant coach of the varsity football team, influenced his players to take tap dance. “The greatest football players have the greatest dance,” he said. Tap dancing helps you with playing football, he explained. The main reason the football players are taking tap is because they want to improve their footwork. Footwork is important because it develops speed and quickness in the player’s legs and feet. Players need to be able to change direction within one step on the football field. Tap dance helps develop just that. Mr. Grimes said he has seen significant improvement in Matthew Goldsmith ’10, Jalen Neal ’11, and Hannibal Robinson’s ’11 footwork. Ready sports fans? It’s time once again to Dodge, Duck, Dip, Dive, and Dodge. The annual McNamara Dodgeball Tournament is set to begin. According to Coach Donald Perham, anticipation of this event had started as early as September. “Anticipation is at an all time high,” he said. This tournament is a Round Robin style and is set to feature at least twelve teams of four boys and four girls. Then the teams will be separated by division with at least six teams playing at a time. The highly favored LBD team hopes to finally win the championship to prove they are better than second place. I asked Alex Powell ’09, one of LBD’s captains, if this was the year they would finally win the championship and he responded, “Definitely. Is that even a question?” If not, Alex Powell and Alex Clore ’09 expressed that they will have next year by passing the tradition down to their junior teammates Jeff Meekins ’10, Annie Czecha ’10, and Jackie Corley ’10. I asked Alex Clore if they had any strategies for winning and he did not want to disclose any details, but Alex Powell informed me of his rigorous training program. He described the process saying, “Dodgeball, eat my wheaties, condition, weight lifting, and more dodgeball.” They hope to leave McNamara with a championship, but having fun is their main goal.